A delicious twist on rice to accompany Korean dishes. 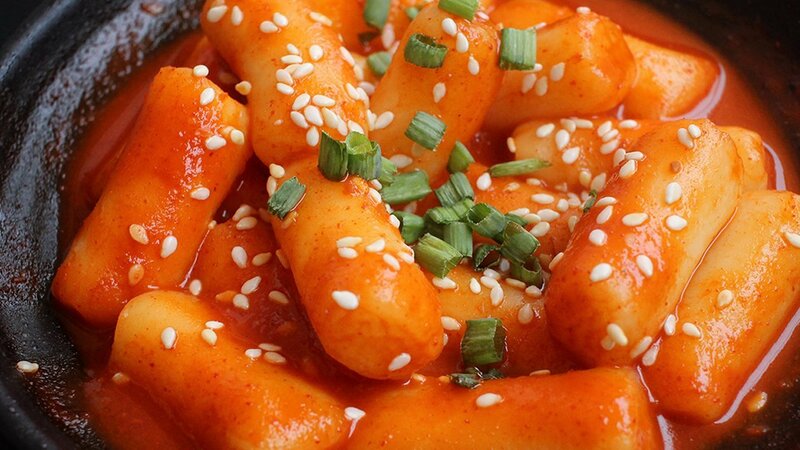 Tkeokbokki are long, thin cylinders with a chewy texture. They are made from compressed rice. Eomuk are made from minced white fish mixed with potato flour and a few vegetables. Often in the shape of a thin rectangle. Both are available from Korean suppliers. Soak the rice cakes for about 20 minutes if hardened or refrigerated. Cut the fish cake, cabbage, and spring onions into 5cm pieces. Made the fish stock by diluting Ikan Bilis seasoning Powder with water to a large pan. Stir in the sauce ingredients. Bring it to a boil over medium high heat, stirring to dissolve the red chilli paste (gochujang). Add the rice cakes. Boil until the rice cakes become very soft and the sauce has thickened, about 8 to 10 minutes. Stir frequently so the rice cake doesn’t stick to the bottom of the pan. Add the vegetables and fish cakes. Continue to boil, stirring constantly, for an addition 4-6 minutes. Taste the sauce, and adjust the seasoning if needed. Add the sesame oil and optional sesame seeds right before turning off the heat. Serve immediately.